All of our tanks are cold rolled AISI 304 stainless steel (316 on request), externally satin polished and internally BA polished, including a cold forged bottom cover with optimised shape, minimum thickness of 2 mm. Many alterations and accessories are available on these tanks as well as other models to suit your needs. They come in a range of sizes and shapes bespoke-made to suit the customer’s precise needs. Starting from 500 litres and going up to 2000 litres, our range is ideal for most applications. 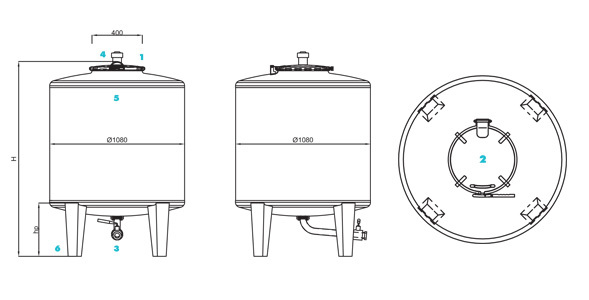 One of our most popular IBC tanks is the SBP1000. This tank is designed for brewing and associated industries, its deep drawn shaped outlet area maximises full products discharge. Its ergonomic shaped base with slots for forklift or manual pallet truck makes this model ideal for a brewing line as mobility is high. This one is available from 545 litres going up to 1533 litres. Or the PCI1000 which is an UN approved stainless steel IBC suitable for hazardous and non-hazardous liquids. With UN/ADR/RID/AND approval for transportation of dangerous products, packaging class II. To see all our stainless steel IBC’s and tanks click here.